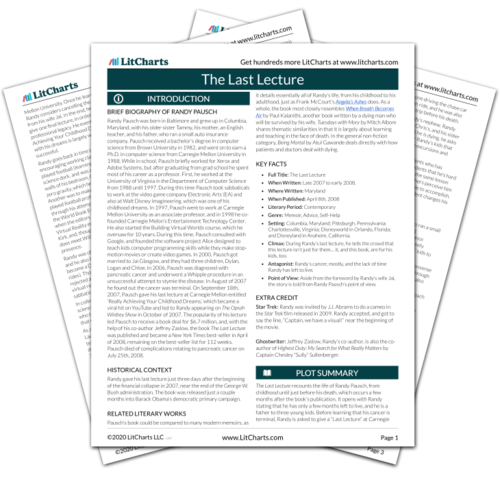 Instant downloads of all 946 LitChart PDFs (including The Last Lecture). 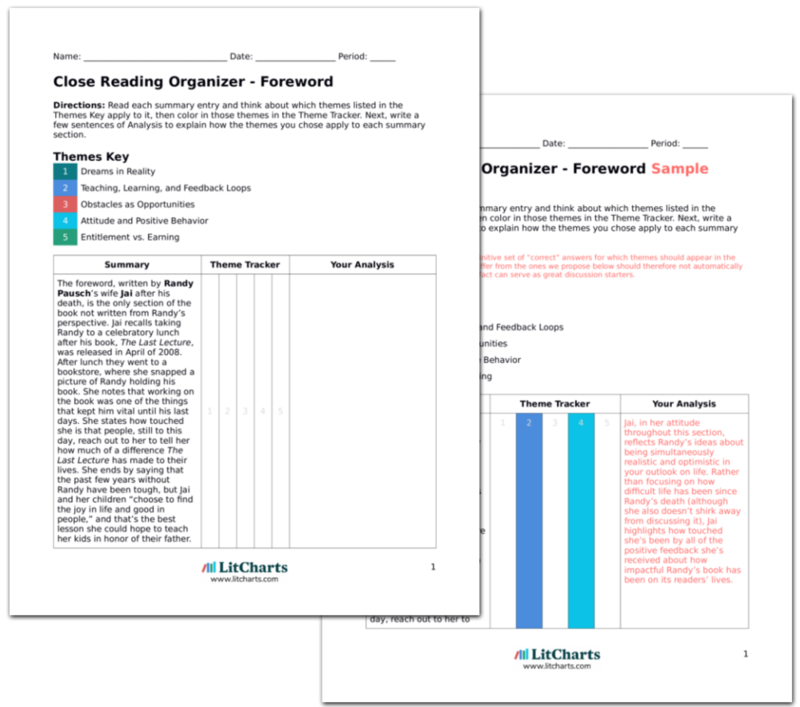 LitCharts assigns a color and icon to each theme in The Last Lecture, which you can use to track the themes throughout the work. Randy cracks a few jokes, and then says his dad always taught him that “when there’s an elephant in the room, introduce it.” So he tells the audience about his terminal cancer, showing an image of the tumors on his liver, entitled “The Elephant in the Room.” He tells the audience this is what it is—nothing will change it. “We cannot change the cards we are dealt, just how we play the hand.” In this moment, Randy says he no longer feels the effects of chemo—he feels like his old, healthy self. Still, he says, he’s not in denial. He shows a picture of the new house Jai and Randy bought so that they could be closer to Jai’s family after Randy passes away. Then, to show them that he’s still okay, Randy drops down to the ground and does push-ups, to the audience’s laughter and applause. Finally, Randy feels that the lecture can begin. If there was ever a quote that sums up Randy’s attitude about having a positive outlook and positive behavior, it is, “We cannot change the cards we are dealt, just how we play the hand.” So, Randy acts that idea out when he drops down and does push-ups—he’s showing the audience that though he’s sick, that doesn’t mean he has to act like it. Koltun, Moe. "The Last Lecture Chapter 3: The Elephant in the Room." LitCharts. LitCharts LLC, 26 Feb 2017. Web. 24 Apr 2019. Koltun, Moe. "The Last Lecture Chapter 3: The Elephant in the Room." LitCharts LLC, February 26, 2017. Retrieved April 24, 2019. https://www.litcharts.com/lit/the-last-lecture/chapter-3-the-elephant-in-the-room.